Cancer is one of the most common causes of death among young individuals. The purpose of this study was to explore the risk of early death (the first five years after diagnosis) among children (0–14 years), adolescents (15–19 years), and young adults (20–24 years) with cancer in Norway, born during 1965–1985. The overall and cancer-specific early deaths were explored by linking population-based national registers (including the Cancer Registry of Norway and the Cause of Death Registry) that include the entire population of Norway (approximately 1.3 million individuals). Hazard and sub-hazard ratios were estimated using Cox regression analyses and competing risk models. A total of 5,828 individuals were diagnosed with cancer (56.3 % males). During follow-up, 1,415 individuals died from cancer (60.2 % males) within five years after diagnosis. 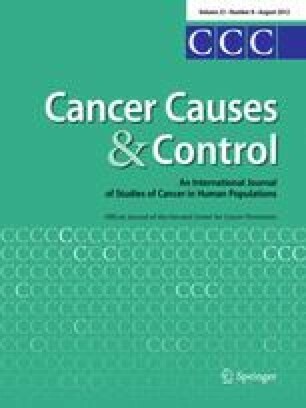 The hazard ratio (HR) of overall death of the cancer patients relative to the general population decreased from 1965 (from HR, 385.8 (95 % confidence interval (CI): 335.3, 443.4) in 1965-74 to HR, 19.7 (CI: 9.3, 41.5) in 2005-09). Over all, there were fewer cancer-related deaths among female compared with male patients (sub-hazard ratio (SHR), 0.83 (CI: 0.74, 0.92)). Except for all hematopoietic malignancies, adolescents and young adult patients had lower risk of cancer death than children. The difference in risk of cancer and overall deaths between the cancer patients and the general population has been substantially reduced since 1965. An erratum to this article is available at http://dx.doi.org/10.1007/s10552-013-0297-7. This work was supported by the Norwegian Cancer Society.